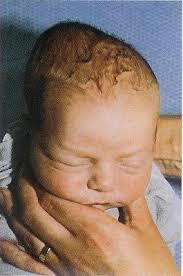 This neonate presents 24 hours after birth with a soft cystic swelling limited to the right parietal bone. It had a well-defined outline and overlying scalp was normal. It did not become tense with crying of the baby. The baby was delivered vaginally to a healthy mother and there were no immediate postnatal complications. A diagnosis of Cephalohematoma was made. often appears late even several hours after birth. It is usually noticed on the second or third day of birth by the parents. It is usually limited on the surface of one cranial bone. Most of these neonates usually do not require any intervention and parents have to be reassured regarding its slow resolution and excellent prognosis. They usually calcify and resolve spontaneously in 2 weeks to 3 months. Incision and drainage is usually contraindicated in cephalhematoma because of risk of introducing infection in a benign condition but it can be advised in rare situations when it is quite large. Some of these large cephalhematomas may lead to hyperbilirubinemia requiring phototherapy treatment. Rarely, if the blood loss is severe then it may require blood transfusion. It has to be differentiated from caput succedaneum which is diffuse edematous swelling of the tissue of the scalp involving the portion presenting during vertex delivery. It is seen at the time of birth and disappears within few days. It may be ecchymotic sometimes. It may cross the midline and crosses the suture lines. No specific treatment is required for it too.